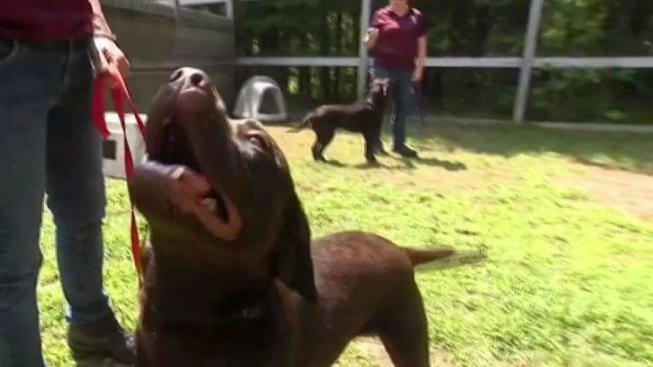 A homeowner in Marlborough, New Hampshire, has been charged with neglect after 52 Labrador retrievers were rescued. More than 50 Labrador retrievers are now spending their days inside a shelter as their owner awaits his day in court, charged with several counts of animal cruelty. It's the largest dog intake the Monadnock Humane Society has ever seen, and their resources to care for the animals are running out. The dogs have been at the shelter for the last month. "What keeps me up at night is making sure they're getting one-on-one attention, and keeping them happy and healthy here," said Operations Director Emily Kerylow. Prosecutors say the dogs were rescued from the Marlborough home of John Riggieri. The Cheshire County Sheriff's Office arrested the 58-year-old this week and charged him with four counts of animal neglect. On the way to his front door, NBC10 Boston witnessed several outdoor crates and empty dog food bags. He's out of jail on personal recognizance bail, but didn't answer the door. On his Facebook page, Riggieri says the charges are "absolute rubbish" and called the case, a "witch hunt." Kerylow says the Humane Society has spent more than $30,000 caring for the dogs — far exceeding their yearly budget in just one month. "Not only are we maxed out space-wise, but it also limits our ability to help our community," Kerylow said. The executive director of the humane society, Kathy Collinsworth, blames the state's poor regulations on commercial dog breeders. "It's an example of what can happen when they don't have to be licensed," she said. Collinsworth says if the laws don't change, these stories won't stop.